With CANIDAE Grain-Free Pure Ancestral Avian Formula, you don’t have to choose between chicken or turkey—now your adult dog can have them both, plus so much more! This tasty, protein-packed recipe contains 3.3 pounds of avian ingredients—quail, chicken, guinea fowl, duck, turkey and raw pheasant. Not only is this freeze-dried kibble made without grains, corn, wheat, soy, potatoes, red meat or fish but it also contains HealthPLUS Solutions—a nutritional trio of probiotics, antioxidants and omega 6 and 3 fatty acids. To top it all off, each batch is raw-coated with freeze-dried raw pheasant for an irresistible taste that even the finickiest canines are sure to enjoy. Contains 3.3 pounds of 6 regionally sourced avian species—quail, chicken, turkey, guinea fowl, duck and pheasant. Crafted for your adult dog with HealthPLUS Solutions—a trio of probiotics, antioxidants and omega fatty acids added after cooking to support healthy digestion, a healthy immune system and healthy skin and lustrous coat. Raw coated with freeze-dried raw pheasant for great-tasting nutrition that will have your pup’s tail wagging with approval. Made without grains, corn, wheat, soy, potatoes, red meat or fish for adult dogs with certain food sensitivities. Quail, Chicken, Guinea Fowl Meal, Duck Meal, Turkey Meal, Lentils, Peas, Tapioca, Turkey, Duck, Chicken Meal, Chicken Fat, Garbanzo Beans, Suncured Alfalfa, Freeze-Dried Pheasant, Flaxseed, Minerals (Iron Proteinate, Zinc Proteinate, Copper Proteinate, Ferrous Sulfate, Zinc Sulfate, Copper Sulfate, Potassium Iodide, Manganese Proteinate, Manganous Oxide, Manganese Sulfate, Sodium Selenite), Vitamins (Vitamin E Supplement, Thiamine Mononitrate, Ascorbic Acid, Vitamin A Supplement, Biotin, Niacin, Calcium Pantothenate, Pyridoxine Hydrochloride, Vitamin B12 Supplement, Riboflavin, Vitamin D3 Supplement, Folic Acid), Choline Chloride, Mixed Tocopherols (A Preservative), Squash, Parsley, Sage, Dried Enterococcus Faecium Fermentation Product, Dried Lactobacillus Acidophilus Fermentation Product, Dried Lactobacillus Casei Fermentation Product, Dried Lactobacillus Plantarum Fermentation Product, Dried Trichoderma Longibrachiatum Fermentation Extract, Basil. Contains A Source Of Live Naturally Occuring Microorganisms. Senior and less active dogs may be fed a reduced amount, depending on the dog's weight and activity level. Grain free diets may not be suitable for all dogs. If you have any dietary concerns, please consult with your veterinarian. When changing to CANIDAE® Grain Free PURE Ancestral™ Avian Formula, some dogs may do better by making a gradual transition over 7-10 days. Start with 25% of the new food mixed with 75% of the previous diet and gradually increase the new while decreasing the previous until the transition is complete. 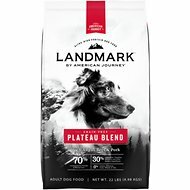 CANIDAE® Grain Free PURE Ancestral™ Avian Formula is formulated to meet the nutritional levels established by the AAFCO Dog Food Nutrient Profiles for maintenance. 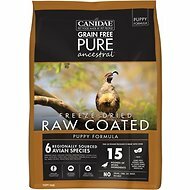 Full of the rich animal protein your dog needs, CANIDAE Grain Free PURE Ancestral formulas are always made with ample amounts of fish, poultry, game or red meat, then coated with freeze-dried raw protein for added flavor. Each 20-pound bag contains up to 17 pounds of animal protein, rounded with whole vegetables. The result is a meal that is similar to what your dog's ancestors ate and thrived on. Savory pieces of kibble become even more delicious when they're coated with raw meat, fish or poultry. Freeze-dried for optimal flavor and texture, a burst of raw adds a little something special into every bite. Not only does it enhance the protein in your pup's meal, but few dogs can resist the delicious aroma and flavor of raw—so you can entice even your pickiest pal. With a variety of regionally sourced proteins in every complete and balanced formula, CANIDAE Grain Free PURE Ancestral formulas feeds your dog's natural instincts with every bowl. Real animal protein nourishes their muscles and fuels their boundless energy, so you know your active pup is getting the nutrition he needs and the flavors he craves. Each formula is made with a variety of ranch-raised, farm-raised, fresh or wild-caught ingredients, to create wholesome, responsibly raised meals your dog will love. Vegetables, legumes and herbs are locally sourced, too, which means your dog's bowl will always be packed with sustainable nutrition you can be proud to serve. The food seems to be really good food. The ingredients are all good, however my Korthals Griffin is a picky eater!! He loves to dilly dally with ANY food that he eats. I've tried Merrick, Instinct and now Canidae. Still takes his sweet time on eating it. I did find if I mix Instincts little gravy topping packets in he eats it just fine. Plus side there were ZERO issues with upset stomach or anything with switching food on him. Time will tell if its better then anything else I've tried. When I brought my min-pin/chihuahua fur baby (Susie Sniffer) home I fed her the same high quality dry dog food that the breeder gave her. She ate it for a short while but then later on she was not eating it. She would go all day without eating. So I tried adding a little milk to it; she would lap up all the milk and leave the food. So I changed her food to CANIDAE Grain-Free PURE Ancestral Avian Formula Freeze-Dried Raw Coated Dry Dog Food. She LOVES this food! I would highly reccomend this food for anyone with a picky eater. I think my pup really enjoys this. I notice it takes less to fill him compared to other brand. Has lots of proteins in it and with all these meats as first ingredients, that is great. 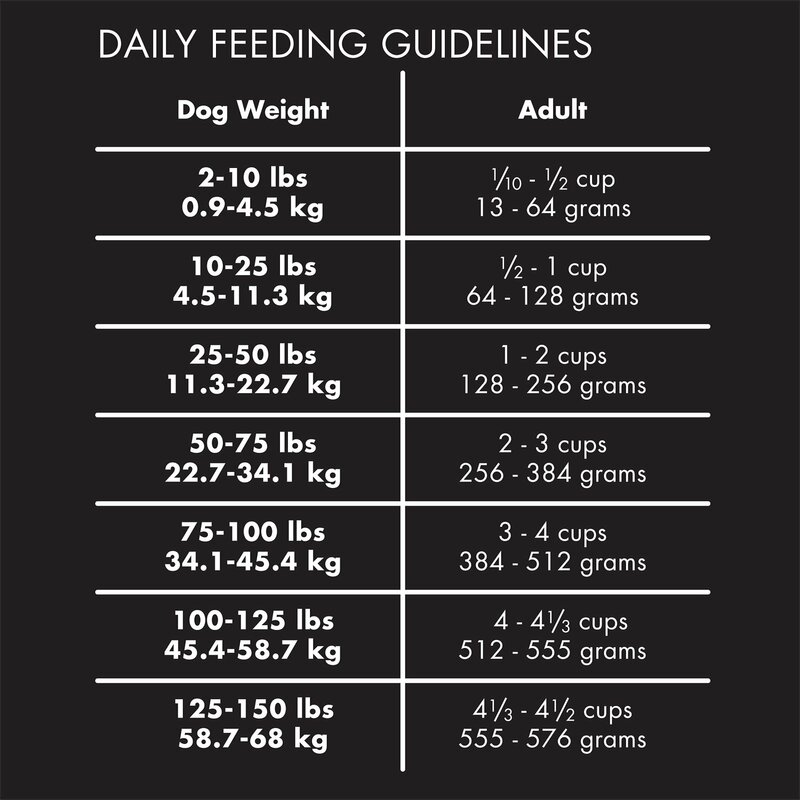 I have Bull Mastiff so go through alot of food so this makes a big difference by him eating less. Our Corso Bella absolutely loves this food and had almost no digestive issues while we transitioned and she clears her bowl everyday. I also want to draw your attention to the ingredients, super high quality and none of the usual junk they put in. I originally gave canidea to my first dog many years ago. She did very well on it. They changed companies and of course it became an inferior product so I changed foods. Present day was looking for a high quality food to add to a food I was feeding for sensitive stomach. The sensitive stomach food was basically just egg whites as a protein and I wanted to add a little more protein to their food. 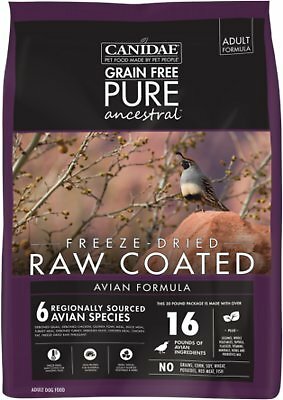 So I did some research and to my surprise CANIDAE Grain-Free PURE Ancestral Avian Formula Freeze-Dried Raw Coated Dry Dog Food received a five star rating. I decided to go back to Canidea and give it a try. So far they are doing very well with the combination. My golden retriever has had problems on and off with itching. I recently transitioned him to this food and he is doing great. He has no longer been itching and absolutely loves the taste of the food. I will definitely buy this food again! My two pits eat it, but they do not absolutely love it. Based on the description, I had higher expectations. Due to the price, I will not purchase again. Just add a tiny bit of water and they eat it up. My miniature Dachshund is the pickiest eater and he loves this. Canidae is a good food, however, my dogs did not care for this one. I ended up using a little broth to encourage them.